We're rounding the corner home with Stockholm Sweden . We entered the port through the Swedish archipeligos, which was a beautiful site. The Stockholm archipelagos are made up of about 30,000 small islands some of them no bigger than a car poking out of the water some large enough for several houses. We arrived around 6am and it was a very quiet glide through the islands. This shot was from our balcony. Once in port there were water taxis to take you to various points of interest including an amusement park, the ABBA museum (which I'm a little bummed we missed), and historical district. Since these are the things we missed I only have this picture of a family of fearless barnacle geese to show you. We opted to spend our time with the Vasa Museum. Above is the remains of one of two famous 17th Century warships to herald the greatness of the power of Sweden sea power. Her name: Vasa. Unfortunately, she sunk within 25 mins of launching out of port. #epicfail #headswillroll (actually no heads rolled). Long story short, the ship's center of mass was too high, this caused it to take on too much water through the gun ports as it swayed from side to side. They did test for seaworthiness but no one wanted to tell the king his new awesome ship was going to sink. Fortunately, the sister ship was corrected and did sail for 30 years until she was blown apart. Ironically, the brackish water and the mud at the bottom harbor actually preserved the ship and it is in far better condition than her sister. The museum is a wealth of information about ship building and what the lives of the sailors looked like and many people have come to study the ship. Just outside the museum was one of the hotdog vendors that a fellow passenger told us to check out. Basically, they take a french baguette impale it to create a hole and squeeze in mustard and ketchup from this cow udder like device (to the right of the guy in the picture). It was pretty good, the crusty baguette was an interesting change from the American bun. With precious little time left we decided to pickup lunch at the Royal Copenhagen where they serve sandwiches and tea from classically made royal floral china (porcelain). The company was founded in 1775 and commissioned by the Queen of Denmark to replicate the fine dishware found in the far east. Turns out they do a nice lunch and tea. I picked the "Sommartallrik" Summer plate featuring cured salmon with creamy dill potato salad, egg anchovy salad with crisp (rye) bread and skagen with roe of shrimp. On our way back I got a nice forward shot of our ship. NOOOO it's coming right for us! We had a sea day on our way back to Denmark the next day. 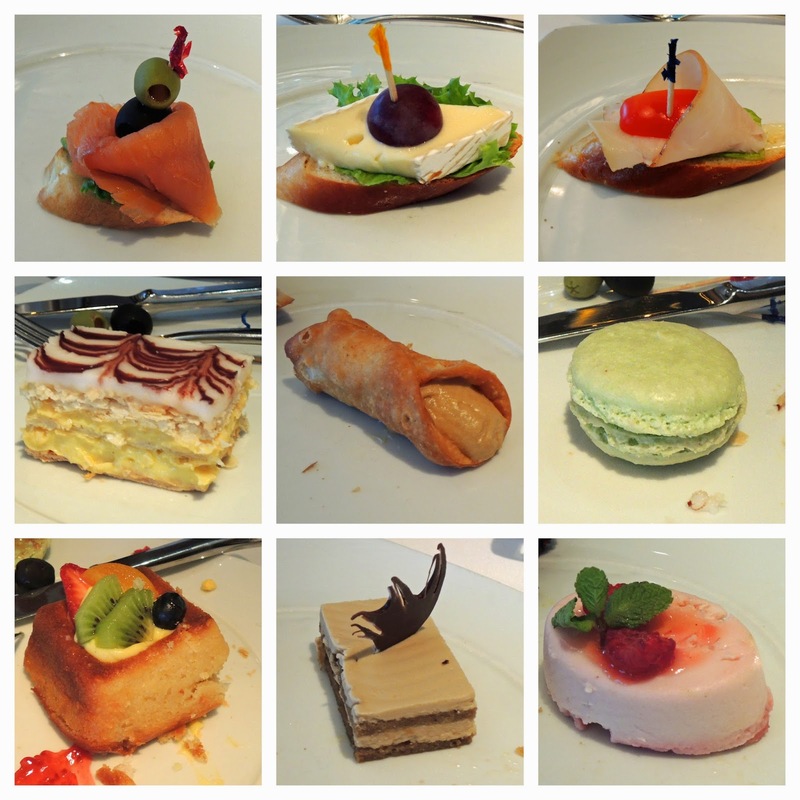 The executive Chef of the boat took our request for reinstating "High tea" at the Oceanliner restaurant and kindly invited us to the "captains club" tea for the frequent travelers. We had a great time talking to our fellow passengers and it was neat to be in the "cool kids" club. We've passed the half the point quite a few points to hit on the way back and we start with Helsinki, Finland. Helsinki is a nice clean modern city we chose to just walk the city and wandered into the city center. This is St. Luther's cathedral it's situated at right at the town square next to the Parliament building. We did a little shopping here to replenish some clothing, the weather was amazing and the people were very friendly and helpful. I realize this is a rare sunny season for the area so it'd be interesting to see what winter looks like here. We did swing by the tourist center and they suggested going Zetor for lunch, it featured a "rustic country" cuisine. There were tractors, wooden benches and rusted signs everywhere. They really did it up with the ambiance. It would have fit right in back home in Texas. The printed the menu in multiple languages and presented like a newspaper. I saw, Finnish, Russian, Chinese, Korean, Japanese, German, and English just to name a few. I took pictures of the Finnish dish names in the hopes of replicating them. We started with a Salmon soup (Lohikeitto), served with potatoes dill in a cream finished with white wine. So very yummy, the salmon was poached tender and fish broth was simply amazing. We almost ordered a second one. My wife selected the Karjalanpaisti: Karelian Stew - Stewed beef, pork and lamb with boiled potatoes, lingonberries and pickled gherkins. I'm not sure about gherkins since they seemed like full sized pickled cucumbers. It was a nice combination of sweet, sour and meaty. One of the big sells from the tourist center was the quote: "well if you're into rustic/country food you can go to Zetor, you can get stuff like Reindeer steak and meatballs." So, I had the Fillet of reindeer (Levin Hullua Poroa). The fillet was cooked Medium rare served with a barley mushroom 'risotto' (which I couldn't get enough of), honey roasted carrots and parsnips and stewed spinach. The reindeer was very game-y, it had a very livery finish and was pretty lean, it reminded me of a sirloin steak. It's amazing how reliant we've become on the internet. My first few trips on a cruise it was simply relaxing knowing that the internet was near impossible to get to. Now however you realize how much you rely on the smartphone for currency, weather, various apps or just knowing where to go in a foreign city. Each wifi hotspot has become an oasis of information to see what's happening at home and just basic information about the city we are visiting. It was a short port visit, we were back on the boat pretty quickly for a 5pm cast off. We went down to the wine bar and took a lesson on french wines. 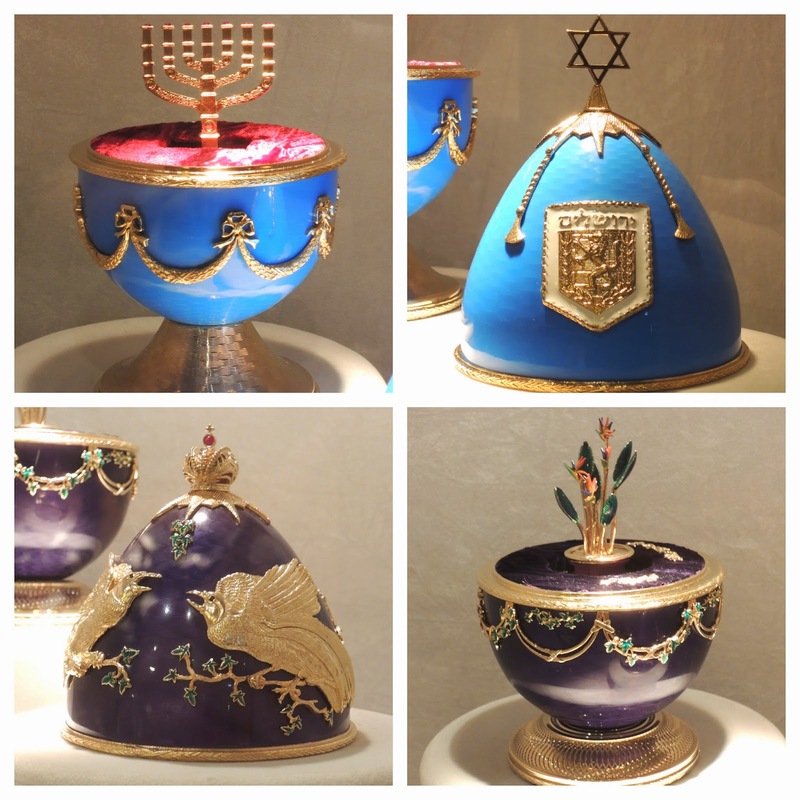 By request I'm posting the pictures of the rest of the Faberge eggs I was able to capture from the Celebrity Constellation exhibit. I don't know enough about the history of these eggs so I'll just be posting the pictures. 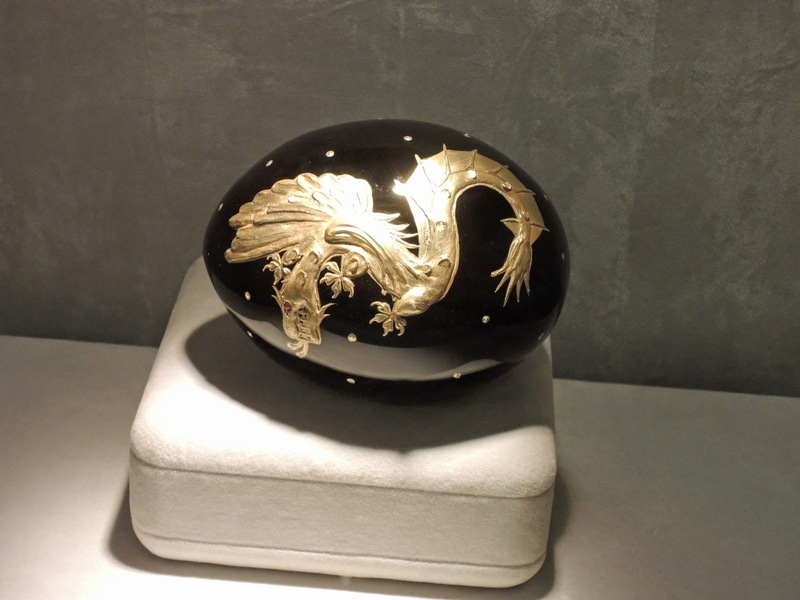 From the egg talk this last egg is one of the first ones produced by Theo Faberge. He was a wood worker by trade and it was the first time the Faberge eggs featured wood as a material to produce the egg. The inside is hollow and meant to hold something of value. The wood on the inside apparently will take on a darker purple shade as the egg ages. It was a cool exhibit. Everyday the Cruise Director (JC) and the Activity Manager (Mark) put on a show (they tape it the night before) basically telling you about the day ahead facts about the destination, stuff happening on the ship and of course they read our letters. It's always entertaining and they've managed to put it up on youtube. Anyhow, this particular day they did warn us about the passport people when you enter the country. Unlike the rest of the trip in Russia in order to go out of the terminal you had to pass through customs and passport checks and you had to be part of a tour in order to do this (no tour = no leave ship). Apparently the tours take responsibility and have a visa deal with the government. The passport people take their jobs very seriously, no chit chat, no smiles just a big cold dose of welcome to mother Russia. So be warned if you take the trip if you intend on seeing Russia book an excursion (or private tour), but do so early as the good tours get filled up fast and there's no "mosey-ing" around the city like the other ports. There were many stands of beautiful fruits, vegetables and herbs and dried goods but we were sternly warned NOT to buy or consume anything (something about having a miserable rest of your trip). Fish and meats were on in various cooling counters. The fish didn't look as fresh as they could have been, some of the eyes were a bit sunken and cloudy. The meat counter did have quite a few things (I saw a butchered rabbit) even some items I couldn't identify. Here's a shot of the pickle counter. We ended our tour at a Russian tea house. This particular restaurant is called "the Last Palace" it use to belong to the nephew of the last Tsar of Russia. During that time all of the family of the Tsar would have their own palaces constructed. This one was pretty ornate but has suffered a bit over the years. Tea was served in what looked like a dance hall. Beautiful granite columns, ornate ceiling and crown moulding and a large painted portrait (I presume the lady of the house with her child). The name Alexander Petrov was in the gift shop so either that's the current owner or perhaps the nephew. On day two we took a river boat tour (which is how I got the outside shot of the restaurant from the day before) and visited the Peter and Paul cathedral. The cathedral was very beautiful with gold leafed works everywhere as well as marble tombs of the Tzar and Tzarinas and family. It is clear that St. Petersburg has quite a deep history with some pretty neat sites to see. From talking to our fellow passengers we really missed out on the Hermitage museum (pictured above). It's one of the largest museums in the world, ranked up there with the Louvre and the British Museum. 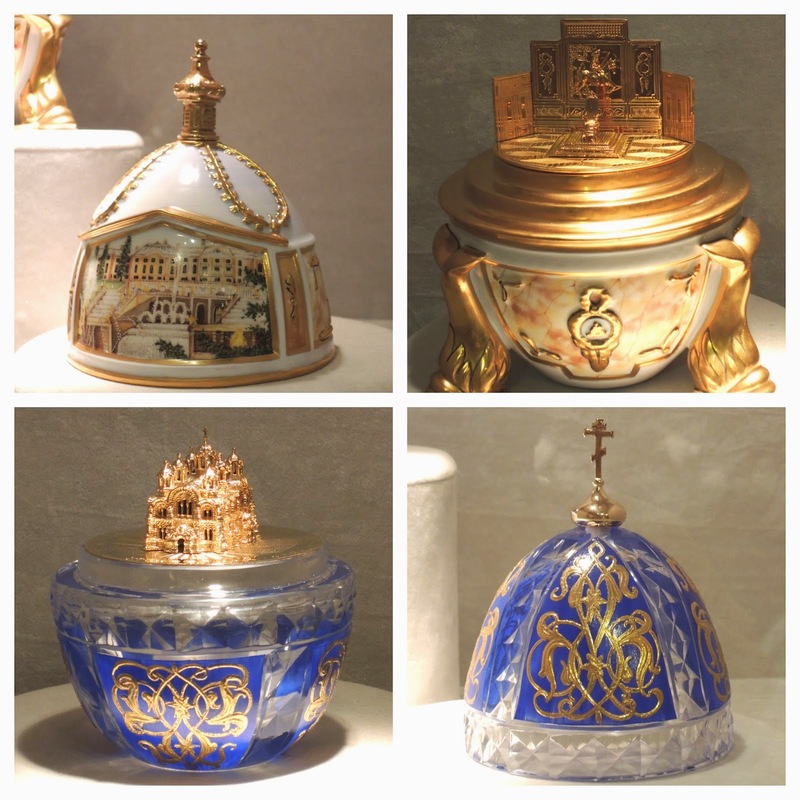 It houses a collection of 3 million pieces across many buildings in St. Petersburg. There's a smaller Hermitage museum in Amsterdam to commemorate the tie the two cities have with one another. Well after a long two days we did go into the main Restaurant on the boat for a nice dinner. 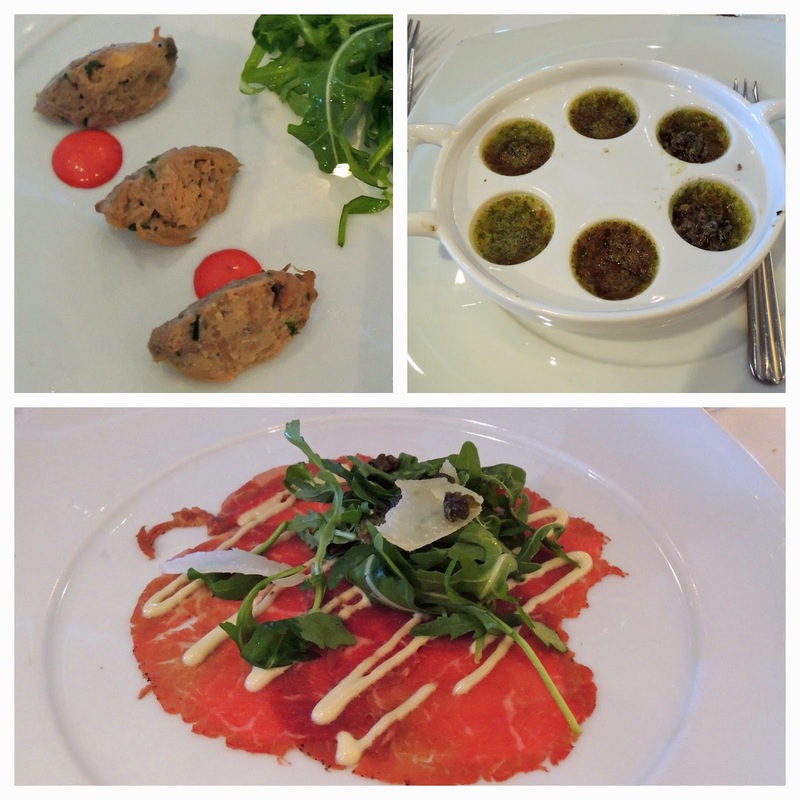 For appetizer I had the duck rillette, escargo and beef carpaccio. And for our main we had this amazing beef shortrib. I really need to get home to work this stuff off. 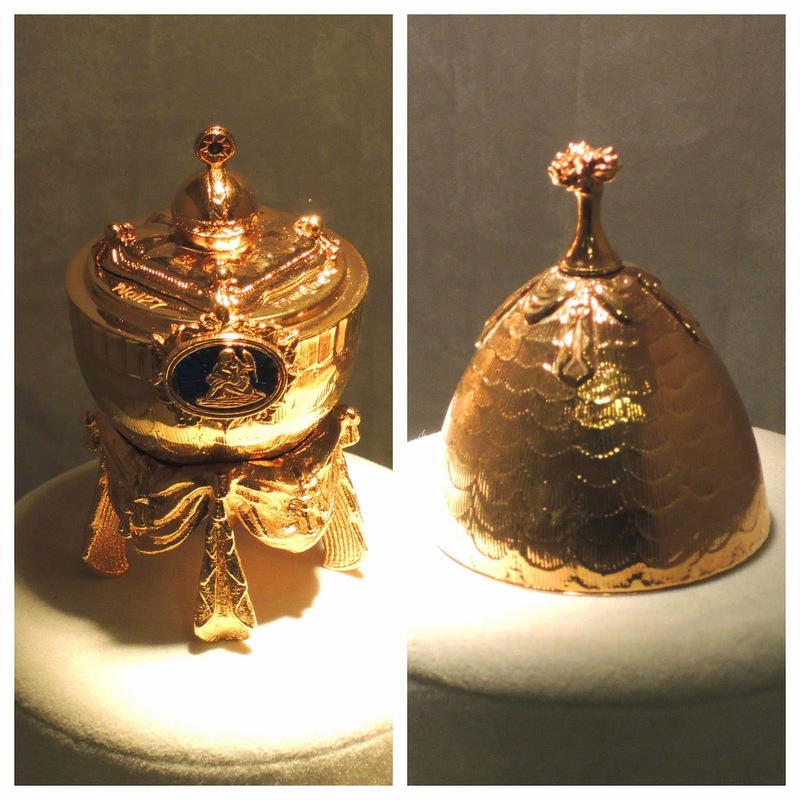 The ship has a standing Faberge egg collection (for sale of course) they range from $4000 to $35000 per egg. 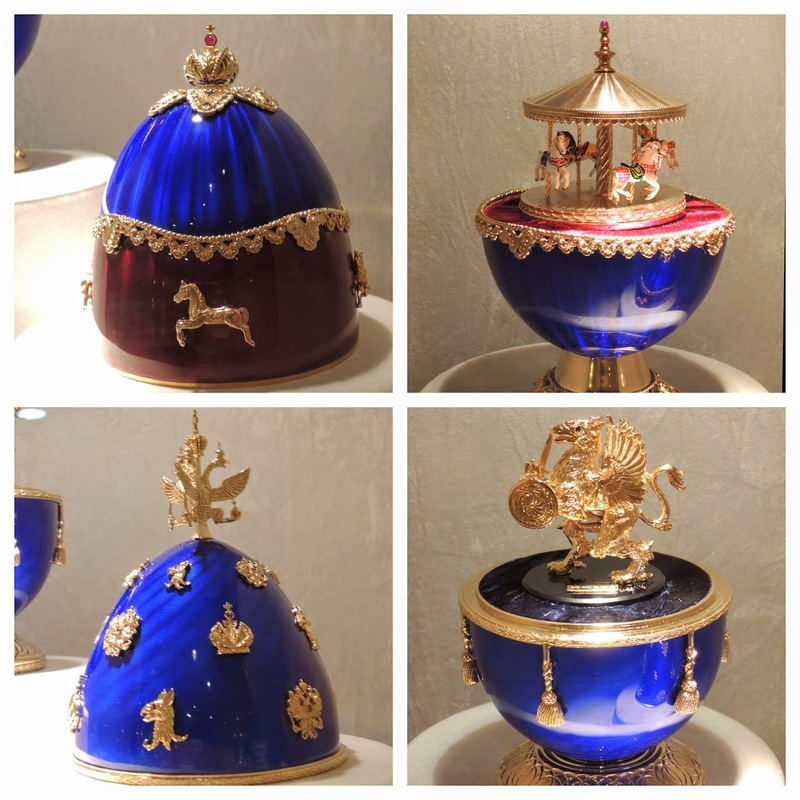 We got a history of the original Russian eggs up to modern day operations when Karl Theo Faberge passed away taking the egg legacy with him. He is survived by a daughter (Sarah) who helped create an egg but she chose to let the egg tradition pass with her father. 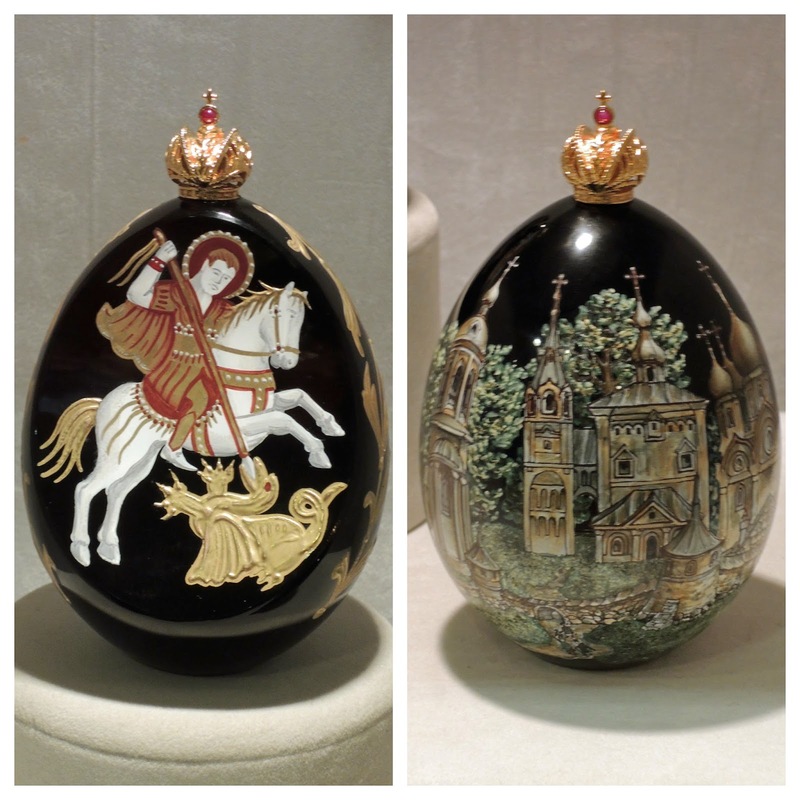 Each egg is hand made and takes upwards of multiple years to create and is held to a high level of quality or they face the merciless hammer of Theo Faberge. If he was dissatisfied with the quality instead of allowing for correction he would take a hammer and smash it to bits and order the egg restarted. This one is a blown lead crystal egg with a set of delicate butterflies that spin and dance to Tchaikovsky when you wind up the base. If there was an egg that I was to buy I think this would have been it. The wings on the butterflies were soon thin and delicate and the egg shows brilliantly in the light. Each of these eggs has several artisans working on them each applying their expertise to the egg before passing it to the next master. The level of coordination or precision necessary to avoid the "hammer" is mind boggling. Back to sea and our second night at Blu featured some good eats. Starting at the top left going clock wise our appetizers start with a vegetable summer spring roll served with sweet and sour sauce. Sauteed Frog legs with chipotle chile sauce. The sauce had a nice sweet heat. Again I skipped dessert to get the smoked rainbow trout appetizer. 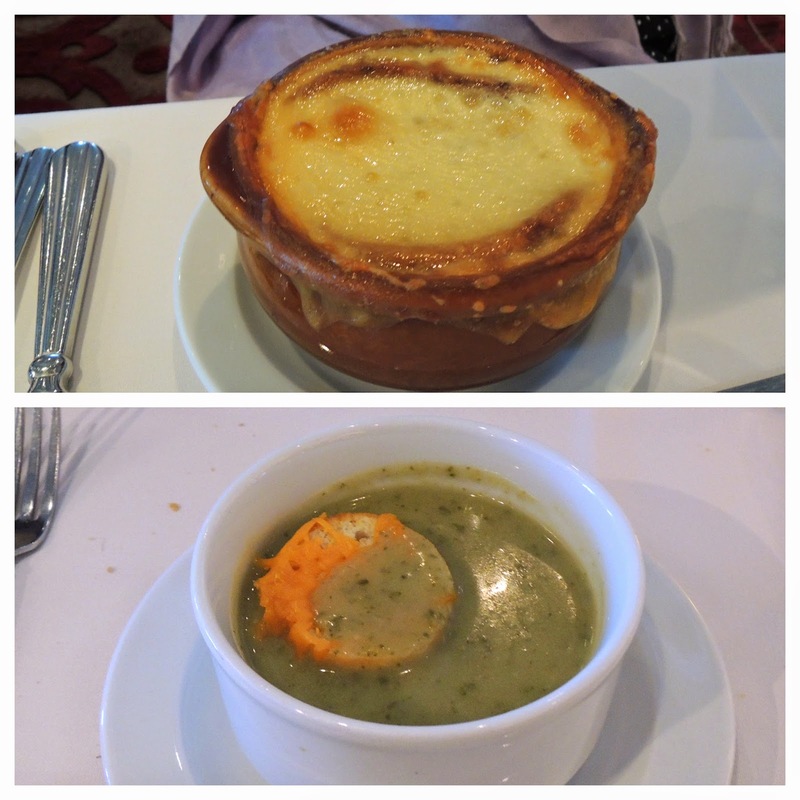 The soup was a creamed whitebean soup with applewood smoked bacon. My wife enjoyed the grilled beef tenderloin salad. I got the Charred Veal Loin with Cauliflower Puree. For dessert we got the Tiramisu. We're having a great time, twelve days is going by quick!. Next stop St. Petersburg. Our second port of call is Tallinn, Estonia. We spent our day in the city center historical districts with it's old cobblestone streets and beautiful architecture. We found the oldest still operating pharamacy. It was pretty neat being part museum and part pharmacy, I'm sure the native population gets pretty annoyed whenever the ships roll in and clog up their place to pick up prescription medication. They had examples of medicinals, equipment (such as a ticture making device), and plant pressings with their medicinal usages all of them look older than say my whole country (which from anyone but the US point of view isn't that big a deal, but it's still a neat statment to make). Wandering up this very steep hill found the King's garden, which would have overlooked the whole town if not for the modern buildings and condos (the price of progress). It looked more like a castle/fortification than a garden but it was meant to be open to the people, they converted the rampart access into a cafe instead of places where you put archers and get ready to dump burning oil upon your enemies ("and hear the lametation of their women" bonus points for those that get that reference). After our walking tour we made our way back to the townsquare and found a Traditional Estonia restaurant Vana Toomas. My wife was quite excited to see pork shank on the menu it was something she was searching high and low for in Warenmunder but the menus there were dominated by fish. In case you go looking for this place it's in the central townsquare facing the church entrance. It's been a trip full of heavy foods so we started this meal off with a salad balsamic vinegar and oil. Of course we weren't to be disappointed in this being too "light" as it came with what looked like 1/2 a pound of chiffonaded parmesan on top. Koorene seene - guitsulohesupp (there's an umlaut over the o) Creamy Mushroom and smoked salmon soup. This was quite good they garnished it with some dried porcini the mushrooms used in the soup were reconstitued porcini, this was a very rich soup, they added what appeared to be two creme fraiche and smoked salmon raviolis and fresh oregano on top. Separately they were good (the soup especially) together they were a bit much. Finally the Suitsoon Seakoot - Smokey pork shank served with a turnip and ginger cake (they called it a puree) and rowanberry sauce. WOW very reminicent of an asian five spice soy braised pork knuckle. The pork fell apart by simply touching it. They left the skin and fat to braise with the shank which (if you did it right) you had a bite of pork with the fat and skin which was heavenly (It might be a bit much for some of those that didn't grow up eating this stuff but trust me, yum!) The ginger and turnip cake was like a steamed turnip cake from dim sum. So far Tallinn wins the local food contest we're looking forward to what the rest of the trip offers.